As with most lenses these days, there are several letters used to describe the Tamron 24-70mm optic, each of which denotes a feature. 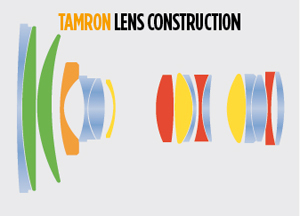 SP (Super Performance) indicates that the lens is from Tamron’s professional range. Indeed, the optical construction is impressive, comprising 17 elements in 12 groups and including three LD (low dispersion) elements, three glass-moulded aspherical elements, one hybrid aspherical element and two XR (extra refractive index) elements. The nine diaphragm blades are rounded to give a pleasing circular shape to out-of-focus areas (bokeh). VC denotes Vibration Compensation, which is a unique selling point for this lens among its competitors. Offering image stabilisation is an advantage because it enables the use of slower shutter speeds of anything up to 5EV while maintaining shake-free results. Tamron does not specify how much extra shake-protection VC gives, but I found it to be up to 4EV while testing the lens. The inclusion of image stabilisation is no doubt a factor that adds to the price of the lens. Finally, USD stands for Ultrasonic Silent Drive, a motor that provides fast and quiet autofocus.